I am in the EU, will I have to pay to receive my kit? Nope! Your kit will be shipped directly from Denmark. However, you will have to pay the shipping back to our lab in Copenhagen. I have a handheld showerhead, can I still participate? Unscrew your showerhead as close to where the water comes out as possible. For some showerheads, there will be a screw directly on the showerhead. If this is what yours looks like, you’re in luck! Your showerhead will work! If your showerhead unscrews at the base of the handle, it may have a filter on the end. If so, you will need to remove the filter. 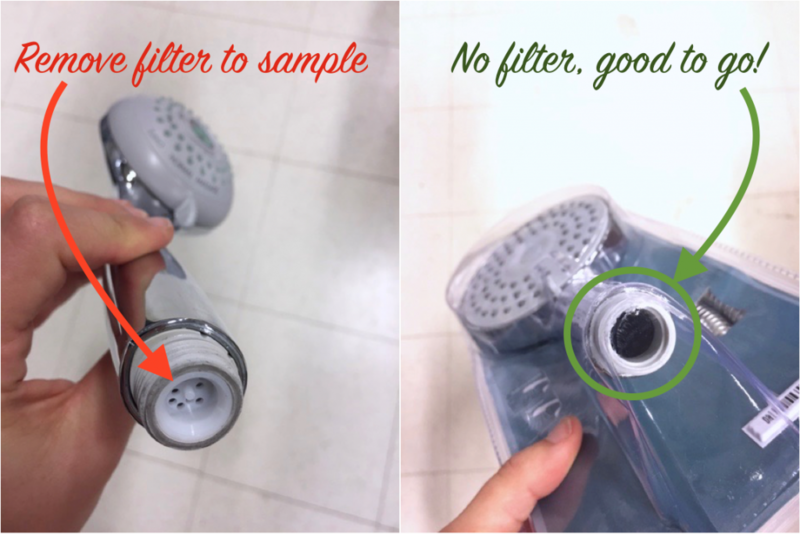 If you are willing (and able) to remove the filter, or your showerhead doesn’t have one, then you can sample your showerhead! I can’t access the inside of my overhead showerhead face – where should I swab? 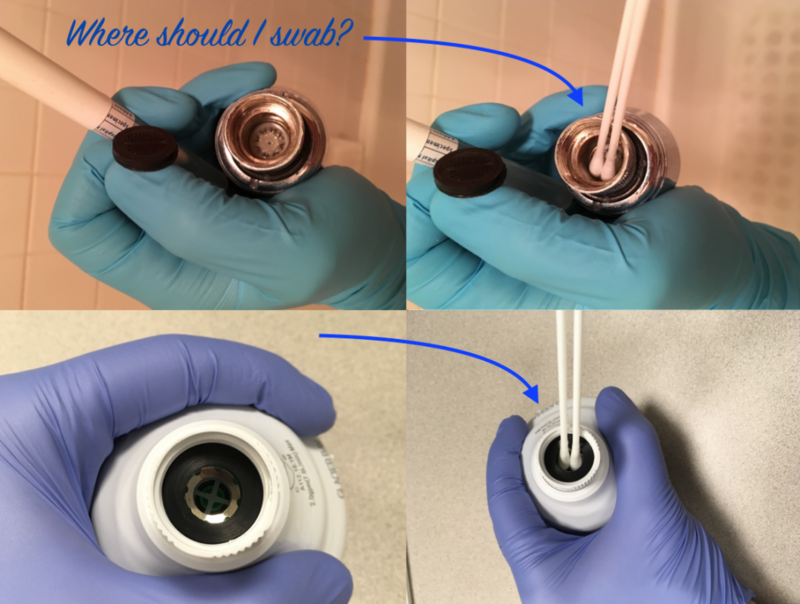 If you cannot access the inside of the showerhead face, try to swab as close as possible to it and swab thoroughly to maximize the amount of bacteria captured on the swab.We want you to swab as close to the interior of the showerhead as possible without disassembling the showerhead. Please only swab the inside surface! Do not swab the outside face of the showerhead. I think that attempting to sample my showerhead might result in breaking it and/or the surrounding plumbing, should I do that? No, we cannot condone breaking your showerhead for science! We would recommend swabbing another showerhead (maybe a neighbor or a friend’s house). We don’t want you to cause a plumbing problem just to get some swab samples! My kit is missing a component, what should I do? If you are missing any part of the kit (ex. the protocol, return envelope, chemistry kit, Questionnaire/Data Sheet, etc), we will try our best to send a replacement. Since these kits were individually assembled by hand, mistakes can happen. Please contact yourwildlife@gmail.com. How quickly should I return my kit after I complete my test? Please place necessary materials (Questionnaire/Data Sheet and swab) into the return envelope (included) as soon as possible. The sooner the swab is placed in the mail and returned, the better the results will be. U.S. Participants: Returning the kit is simple – all U.S. kits have a prepaid USPS return envelope included. Just place the swab and questionnaire/data sheet in the envelope, seal it by removing the tape, and place it in a mailbox! It should arrive at the University of Colorado in 2-3 days. International Participants: Return envelopes need to have postage paid by the participant. Just place the swab and questionnaire/data sheet in the envelope, seal it by removing the tape, and place it in a mailbox! It should arrive at the lab in 1-3 weeks. The colors on my water chemistry test do not match exactly the colors on the protocol, is something wrong? No, the colors will not be exact since some values will fall between two colors, and there will slight variations. Estimate the closest value associated with the color to the best of your ability. If I have a biofilm in my showerhead, does that mean I am risk for an NTM infection? Should I talk to my doctor? No. These tests are not diagnostic. We cannot make any medical claims or provide any sort of insight into a clinical diagnosis. Once the results start coming in, we will provide a more comprehensive discussion of what your results do or do not tell you about the water quality in your home and why you should probably not be worried about what bacteria we find inside your showerhead. Do I have to wear the gloves included in the sampling kit? Yes. The gloves are not for your protection, but rather to prevent any sort of contamination from the skin to interfere with the showerhead biofilm sample. I signed up for the project with an address, but want to test the showerhead at a friend or family members house (different address), is this possible? Yes, if you are testing at a different address from where you received it, please make sure to record all the information regarding the showerhead location on the top of the Questionnaire/Data Sheet. I signed up stating I was interested in the project, but never received a kit. Did something get missed? The Showerhead Microbiome Project is happening in several waves. Just because you were not contacted in the first group of 500 people, does not mean you will never receive a kit. How long will the analysis take? Any updates? We are just as excited as you to figure out what is in your showerhead! But science is slow. The time between when you send a sample in and when you know what is on your showerhead may be a while. Our guess now is that it will take about a year.